(Natural News) A proper and meticulous sorting of scrap car parts could improve recycling rates of alloy elements to more than 97 percent, generating billions in savings and reducing greenhouse gas emissions, a study by Tohoku University researchers and their colleagues showed. According to the study, optimizing the recycling process could result in a savings of $287 million (31.6 billion yen) on raw materials, and slash greenhouse gas emissions linked with acquiring new material by over 28 percent. Even though Japan requires automobile recycling, scrap car parts are usually lumped together for iron, according to the study that was published in an issue of the journal Environmental Science & Technology. As such, specific alloy elements that are found in the scrap, such as chromium, molybdenum, manganese, and nickel, are not optimally recycled. The researchers studied what scrap car parts are made of and what they could be reused for, and were able to determine that they were best suited for nine steel alloys. Such analysis showed that between 94 and 99 percent of the alloy elements could be recycled from the scrap car parts. The scrap metal would undergo the process of melting down in electric arc furnaces and reshaped into steel products such as coils, bars, and plates. Such recycled allow elements could be used instead of 10 percent of the new material used by electric arc furnace (EAF) steelmakers. The researchers made a comparison of the tradeoffs between decreasing costs versus emissions. A fairly small amount of compromise could result in almost the greatest emission reduction, the researchers said, adding that they had found out which recycled alloy elements contributed the most to this setup. Today, automobiles are the most recycled consumer product. In the U.S., the car recycling industry is the 16th largest, giving $25 billion annually to the gross domestic product. Around 100,000 people are working in the U.S. automotive recycling industry, earning $25 billion a year. There are 7,000 vehicle recycling facilities around the U.S.
Around 12 million cars are recycled in the country annually as compared to the eight million cars that are being recycled in Europe every year. In 1997, the U.S. reported a gross annual revenue of $7.05 billion while Canada reported $1.15 billion. During that year, both countries recycled around 4.7 million vehicles, with six million car tires and 11 million car oils recycled. Automotive recyclers spent $50 million on environmental compliance. 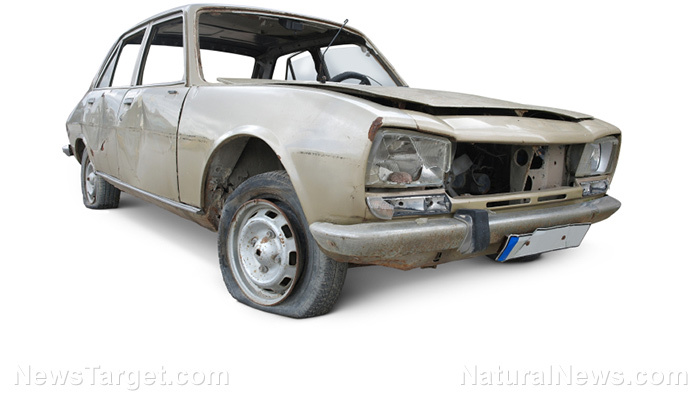 The international auto recycling industry is currently at 75 years old. It is usually made up of small businesses, with 75 percent of all automotive recycling companies employing only 10 people or less. Car engine oil is extremely polluting to the environment and needs to be disposed of properly instead of being dumped into places where it can contaminate waterways and groundwater. According to Australia’s Department of the Environment, “It takes only one liter of oil to contaminate one million liters of water.” The department added that around 25 percent of waste oil could be recycled. Unused car tires, on the other hand, clutter landfills. They can also become a breeding ground for mosquitoes and are potential fire hazards. Tires can be reused to make sandals, insulation blocks, compost pits, road surfacing, ute mats, vegetable planters, among other things. For more stories on how to conserve the environment, visit Environ.news.